Come see this impressive Fort Lauderdale Boat Show IAG yacht! : Atlantic Yacht & Ship, Inc. 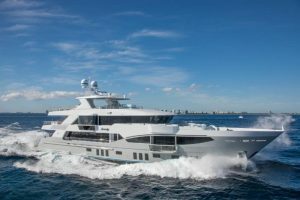 The 133′ Fort Lauderdale Boat Show IAG yacht is brand new and freshly commissioned, this 133′ IAG Yacht “Serenity” for sale is stunning! The owner is open to a yacht partnership deal so this is your chance to get a huge yacht for half the price! She has great charter potential and an even better layout! In the first place, this 133′ Fort Lauderdale Boat Show IAG yacht “Serenity” yacht is also known as a 133′ IAG yacht “Serenity” model. This yacht was a smash hit created by reputable yacht designer Evan K. Marshall. Coupled with the fact that this yacht is available for sale AND for charter! With a popular Tri-Deck layout, this yacht is sure to impress with ample space. Furthermore this is the latest and greatest in EKM design. Her fit and finish are sure to impress the most discriminating yacht connoisseur! Overall, major highlights on this 133′ Fort Lauderdale Boat Show IAG yacht “Serenity” yacht are innumerable. They include the interior four-level elevator that comfortably services all decks. Moreover the floor-to-ceiling windows, multiple balconies, and light-box flooring are spectacular. Additionally, the back-lit Onyx throughout the saloon is stunning and one-of-a-kind. She features a convertible stateroom which makes this a five or six stateroom boat. Therefore, she accommodates ten to 12 guests accordingly. A spectacular waterfall Jacuzzi on the fly bridge flows into a lovely foot pool. The back-lit sky lights of the foot pool shine through the ceiling to the sky lounge deck for lovely effect. This is just a taste of what this 133′ Fort Lauderdale Boat Show IAG yacht “Serenity” has to offer. For more information on this impressive yacht contact Joe Marino or Doug Hoogs today! Come visit us at the 2016 Fort Lauderdale Boat Show! Come see this Fort Lauderdale Boat Show used 88′ Sunseeker yacht!